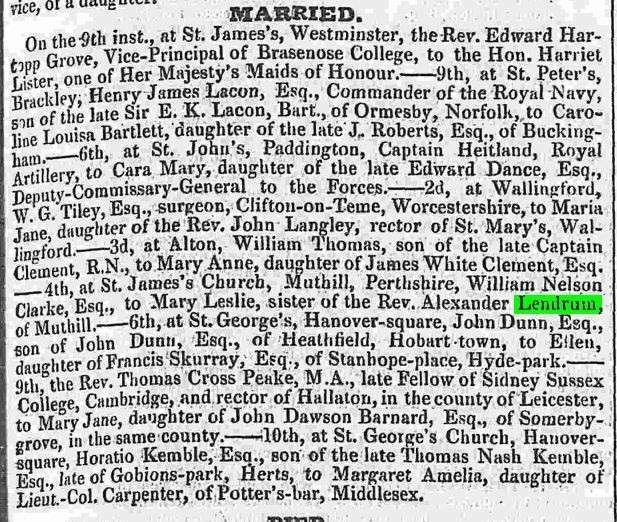 Recorded here because a Mr. Willlie Blomfield (best man ) and a Miss Lendrum (bridsmard) attended the wedding. 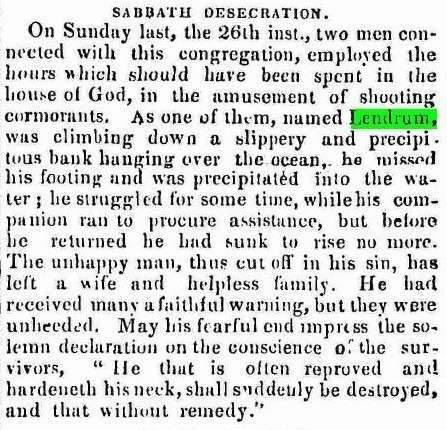 In the paper of the 27th September 1873 (3) a Mr. Lendrum was thrown from his horse. Could this be the same Lendrum? 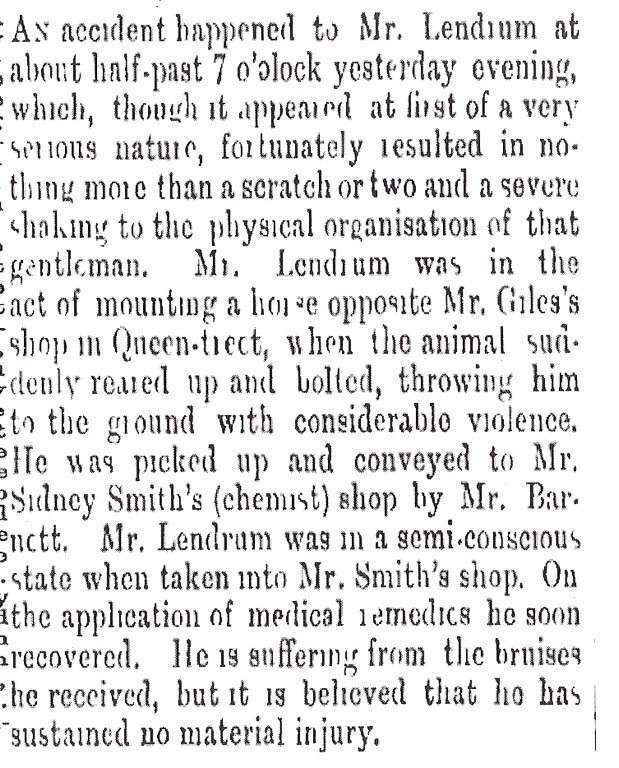 Cruelty to a horse: (4) a story involving a Mr. George Lendrum. 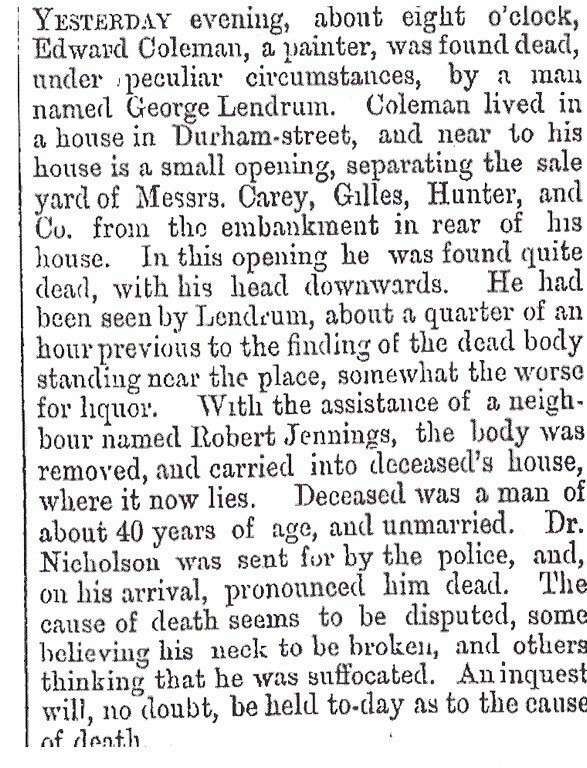 The body found by a Mr. George Lendrum. Mr. George Lendrum again was on the scene. Charlemont Hotel - 10 Charlemont Street East, Ranfurly, Auckland. The final match between the Newton and Ponsonby second fifteens in connection with the First Junior Championship was played on Saturday at Epsom, and resulted in a win for Ponsonby by 18 points to nil. For the winners a try each was scored by Griffin, Graham, Merrith and Lendrum, and Masefield converted three of the tries into goals. Of the individual play, Lendrum is deserving of first mention, as he played a good sterling game and made many openings. Of the others, Kelly, Meemield, "Upton and Edwards among the backs, and Graham, Cooke, Merribo and Griffiths among too forwards all played good games, while Kelly, Wilson and the centre-half figured conspicuously of the Newton backs, and the brothers Farrell, Bach and Walker of the forwards. By this win, Ponsonby conclude their career this season with 10 wins and 1 draw out of 11 matches played. Thames Star; dated 28th May 1900. Ponsonby v Suburbs - Ponsonby won by eighteen points to nil. Three tries to Lendrum - Rylance converted all three. Thames Star; dated 11th July 1904. 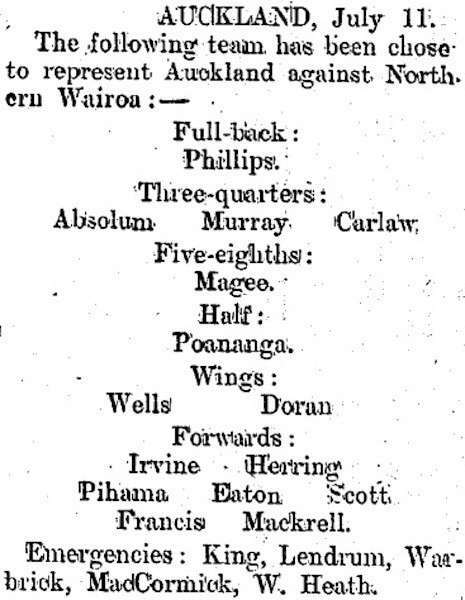 Auckland v Wairoa: Lendrum in reserves. 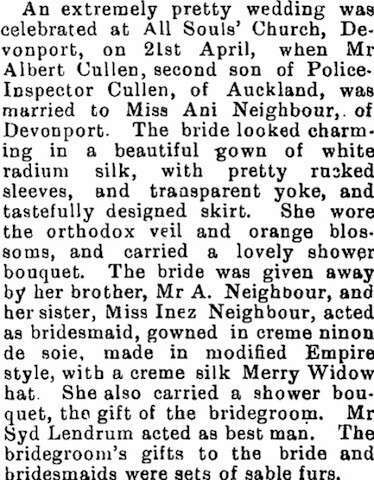 An extremely pretty wedding was celebrated at All Souls' Church, Devonport, on 2Lst April, when Mr Albert Cullen, second son of Police- Inspector Cullen, of Auckland, was married to Misa Ani Neighbour,, of Devonport. 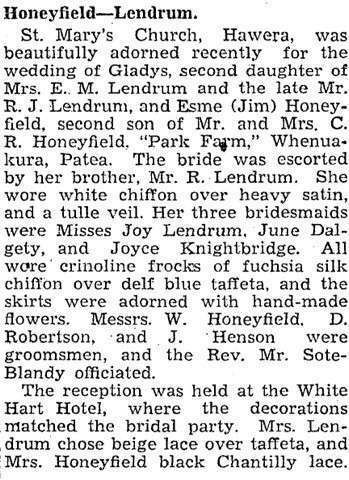 The bride looked charming in a beautiful gown of white radium silk, with pretty rinked sleeves, and transparent yoke, and tastefully designed skirt. She wore the orthodox veil and orange blossoms, and carried a lovely shower bouquet. 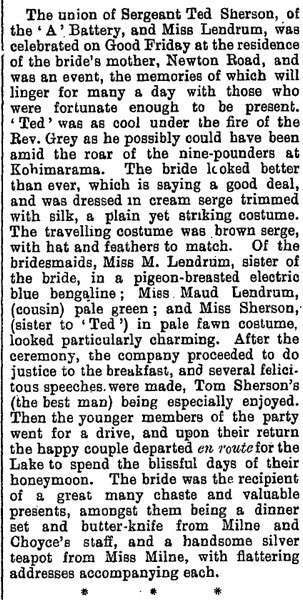 The bride was given away by her brother, Mr A. Neighbour, and her sister, Miss Inez Neighbour, acted as bridesmaid, gowned in creme ninon de soie, made in modified Empire style, with a creme silk Merry Widow hat She also carried a shower bouquet, the gift of the bridegroom. 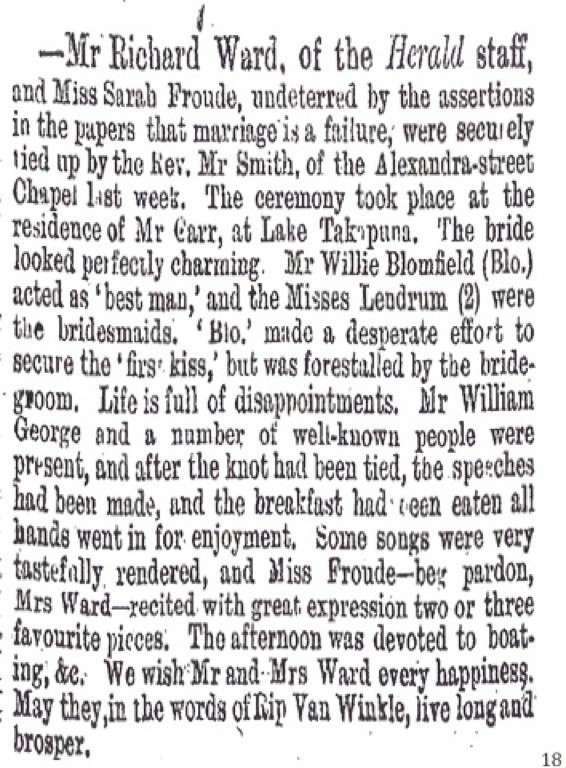 Mr Syd Lendrum acted as best man. The bridegroom's gifts to the bride and bridesmaids were sets of sable furs. Mr. T. B. Lendrum, postal inquiry officer at Hamilton, has been appointed postmaster at Taihape. Mr. Thomas Bassett Lendrum, deputy chief postmaster at Hamilton, has been appointed chief postmaster at Blenheim. A Press Association telegram from Gisborne reports that Wing Commander Colin Gray arrived home by air yesterday, his visit being his first since he joined the R.A.F. in 1938. He was greeted by local body representatives and a few friends, and he went straight home. He will be given a civic welcome today. Mr. George Lendrum (?) a very old resident of Auckland, died a few days ago, at tho age of 77. A red letter date in the history of New Zealand cricket will be the day on which Sir Julien Cahn's cricket team steps ashore in New Zealand. Sir Julien, a wealthy London business-man, makes cricket his hobby, and yearly assembles a team of cricketers worthy of international ranking and takes the team on tour. March 15. Sir Julien Cahn's touring cricket team had to fight doggedly today to avert loss on the first innings against Bay of Plenty in a one-day game played in ideal conditions. The Bay, which won the toss, played an attractive innings for 233, which, in contrast to' the display of the Englishmen, was scored fast. R.. Barlow gave! a brilliant exhibition of exhilarating cricket to score 51, and N. Bayley, who faced all the visiting bowlers with the utmost confidence, scored 76. These two batsmen were mainly responsible for the great recovery of the Bay team, which, at one stage, had lost five for 53. There were sensations in the early part of the Englishmen's innings, when Sir Julien Cahn was dismissed with the score at 1 and Dyson went with only 2 added. Jackson was out with the total at 18, and Smith dismissed Oldfield' with the score at 21, Smith having taken three wickets for 11 runs. " After these reverses the Englishmen became more cautious, Mudge playing a sound but patient game. The fifth wicket fell shortly after the tea adjournment, when Heane went legbefore to Barlow for 18, with the total at 55. With the game in a serious position, Dempster was sent in in an effort to stop the rot, but he did not get going, being trapped leg-before by Barlow j after he had -scored only 2. For the remainder of the afternoon the English batsmen' provided a very drab exhibition in the face of steady bowling, and it was not till the final! over, when Walsh opened out to Lendrum, and as a result lost his wicket. Stumps were drawn at 6 o'clock with the Englishmen's score 121 for eight wickets, the. game being drawn. L. R. Spring, run out 23 N.
Charles Blake. 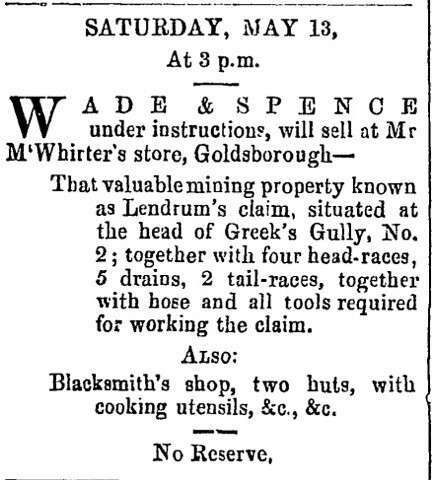 I am a miner residing at Tunnel Terrace, Stafford. I know James Lendrum and John Pozzi. They both live near, me. I recollect the evening of Wednesday, 17th. I saw Lendrum that evening ; he was about 160 few steps from Pozzi's house, going towards Stafford ; be told me what had occnrred. I did not look at the injuries ; there was dark matter about his face and arm. He gave me his key and I went to his house and made up the fire. In less than a hour Lendrum came back to his house ; I then saw that he was bruised about the head and about the arm and that the dark matter was blood. I heard nothing of the quarrel. William Hooper Teague l am a miner living at Tunnel Terrace, Stafford. The complainant, James Lendrum is a mate of mine ; the accused, John Pozzi, I also know, he is a neighbor. I recollect last Wednesday evening, 17th Lendrum came to my place about 8 o'clock ; he was bruised and bleeding ; he had cuts on the arm and on the head ; he told me how be got them ; I bandaged the arm and then sent for the police ; Lendrum remained at my place till Sergeant Hannan arrived ; we .then all went to Lendrum's house. Pozzi was standing on the road talking to women; Sergeant Hannan spoke to Pozzi and asked him how it happened ; I don't know what Pozzi said in reply. 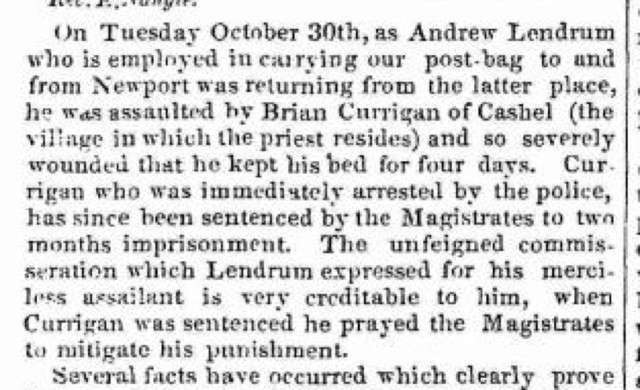 We then went towards Pozzi's house, Mr Hannan then charged Pozzi with striking Lendrum with an iron bar. Pozzi denied it o 'saying he had no iron bar. Pozzi picked! up two stones at the gate which, he showed. to Sergeant Hannan saying " these are the , stones that Lendrum threw at' me." He showed us where the scuffle took place. He gave Sergeant Hannan some stones. I examined the place ; there was blood about. Sergeant Hannan arrested Pozzi and brought him down. I came down with them. I saw no blood on Pozzi. 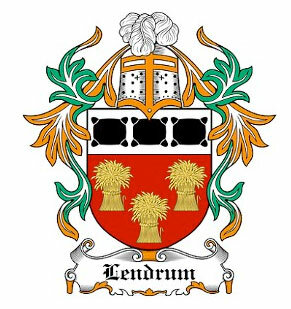 I have known Lendrum for six years ; as far as I know he is a quiet, inoffensive man. I know Pozzi. I don't know that he is quarrelsome. I don't know .that there has been a disagreement, but I know that they have been on unpleasant terms. 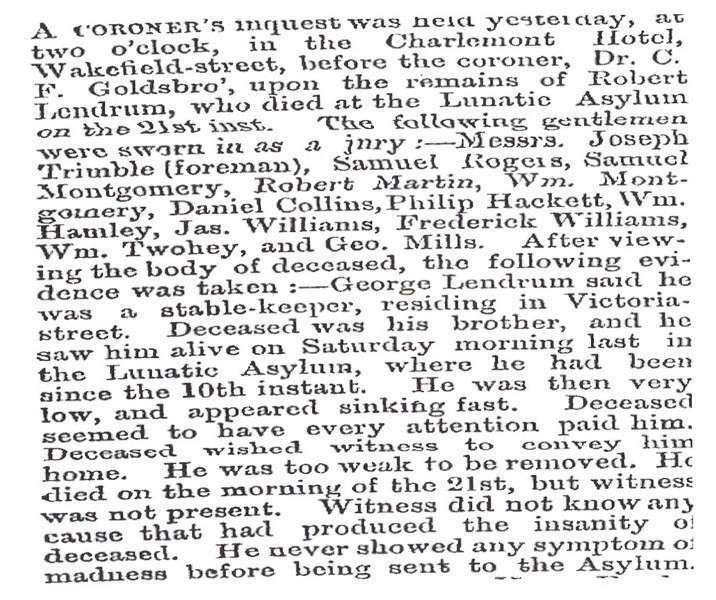 Northern Advocate dated 15th March 1912. 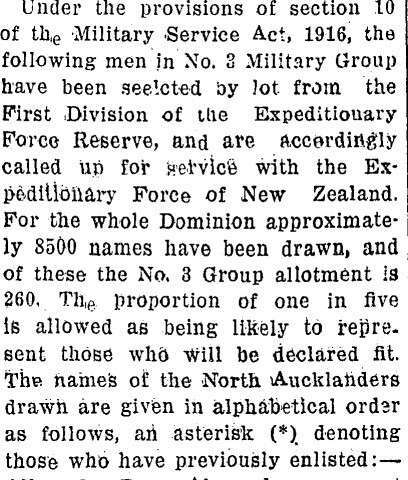 The Southern Cross began as a weekly paper in Auckland on 22 April 1843. 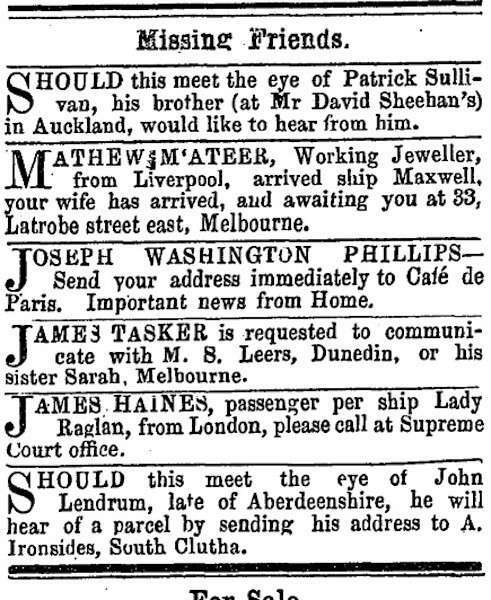 In 1862 it became the first daily newspaper in Auckland, changing its name to the Daily Southern Cross. The Southern Cross was merged with the New Zealand Herald, which is still published today, in 1876. 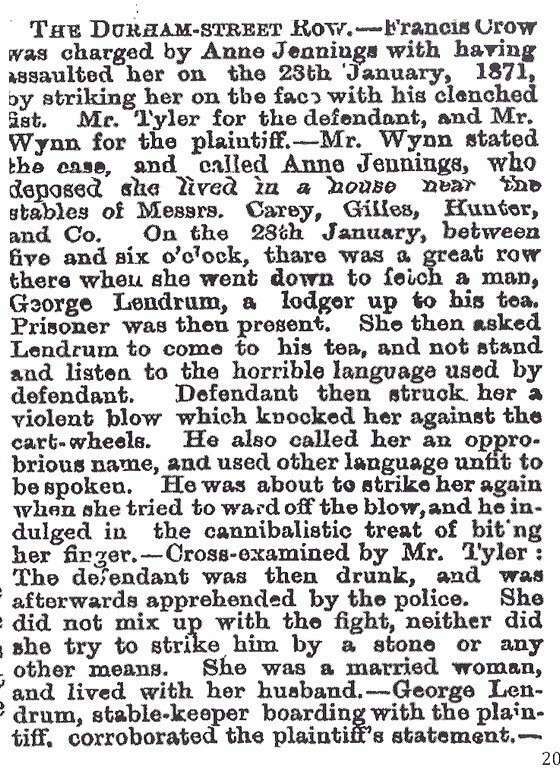 Ashburton Guardian, Volume XL, Issue 9269, 31 March 1920. 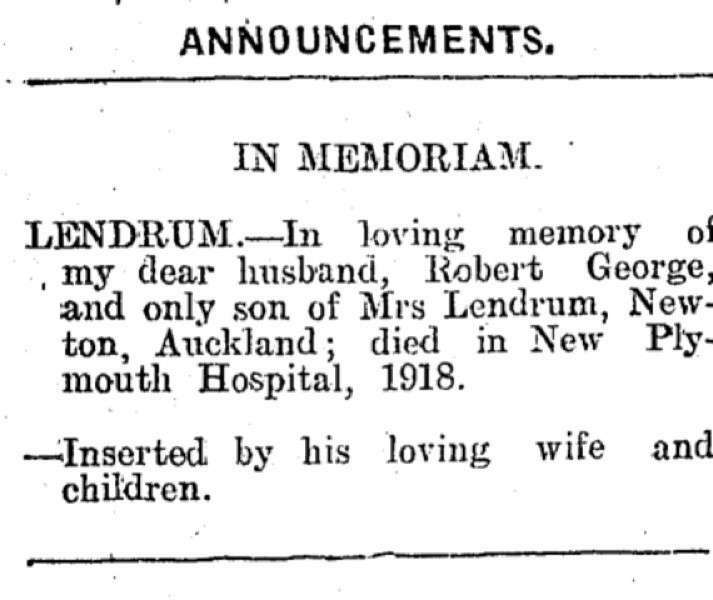 - Who is this Robert George Lendrum: late of New Plymouth? Mr James Lendrum, an old and respected resident of the Golds-borough district, and a recipient of tho Old Age Pension, burst a blood vessel of the brain on Saturday morning, and was removed to the Kumara Hospital where be died on Monday morning. 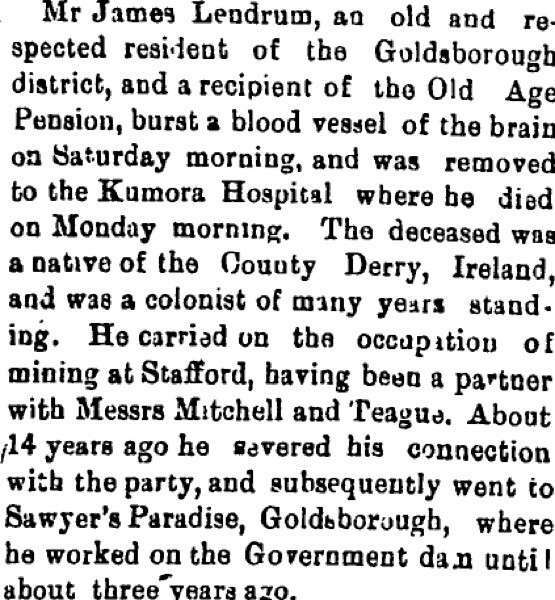 The deceased was a native of the County Derry, Ireland, and was a colonist of many years standing. He carried on the occupation of mining at Stafford, having been a ? with Messrs Mitchell and Teaguo. About 14 years ago he severed his connection with the party, and subsequently went to Sawyer's Paradise, Golds-boruugh, where he worked on the Government ? until about three years ago. Golds-borough was a mining township in the Hokitika / Stafford district, South Island, New Zealand. Voter's Name LENDRUM, Robert George, Mrs.
Sydney LENDRUM 16 Jul 1936 address corner Pompallier Tce and Bayard st, Auckland. he was in Liverpool as a stone mason? (aged 44 years).